Ripanuda is a brand new project from four dynamic young winemakers: Giacomo, Niccoló, Alberto and Michele. The men were friends for years, but found themselves working in wine throughout the world, cutting their teeth in Tuscany, Friuli, Calabria, California, South Africa and Serbia. When Alberto’s grandfather Beppe offered them a beautiful vineyard in Gaiole, situated on one of Tuscany’s highest hills in the heart of Chianti Classico, they jumped at the chance to return to their roots and work together close to home. The winemaking team blends an immense respect for tradition with modern training acquired in Bordeaux and at U.C. 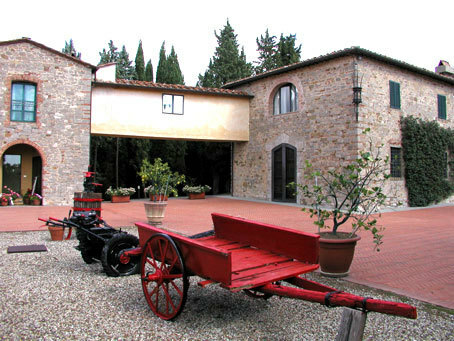 Davis, and they have crafted elegant and harmonious reds that scream of Tuscany but will appeal to all. Giacomo trained at an estate in Tuscany, that must remain nameless, known for crafting some of the most acclaimed value wines in Italy. Alberto has also made a name for himself, having earned several Tre Bicchieri awards as winemaker for another famous “thoroughbred” estate in the Chianti Classico area. In short: we have a stellar group of experts making amazing quality Chianti Classico for a ridiculous value price! All fermentation is done in temperature-controlled stainless steel, and the boys are committed to sustainable and organic agriculture.